This PowerPoint explains to students what dental hygiene is, how they can keep their teeth healthy, and what will happen if they do not take care of their teeth. Celebrate Dental Month/Week with a colorful poster that contains a delightful poem for students to chant. Also included in this product are Dental themed bookmarks, watches and hat, all in black and white for students to color. Printing on card stock is recommended for durability. These worksheets go along with the Dental Hygiene PowerPoint presentation. There are both fill-in the blanks and multiple choice worksheets in this packet (for differentiation purposes). 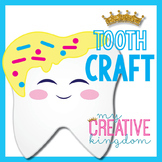 Dental Hygiene Activities: "Counting Teeth With Timothy Tooth"
Happy Teeth Dental Health Flip Book Students will research, write about, and reflect on healthy dental habits that keep teeth happy with this Flip Book. The book includes 5 pages of research and writing prompts and are easy to assemble! 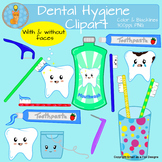 This is a card game created to review the Dental Hygiene Unit Information. On the cover page there are directions on how to utilize these cards. 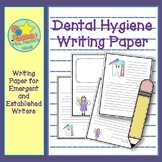 If you're looking for a fun resource to help with dental health writing, this package includes themed dental hygiene writing paper and lined paper for emergent and established writers. Art work created includes a tooth fairy, two tooth characters, toothbrush, mouthwash, dental floss and toothpaste. This includes the printable to make a boy and a girl paper craft. Slide a word card to change the smile from germs to clean after the children have brushed their teeth. It also has a reading passage for the children to practice reading. A yummy food activity your students will enjoy. 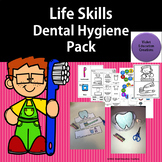 A quick activity that goes along with a Dental Hygiene unit.